Get this Diagonal Striped Genuine Leather Backpack – a handbag that is a stylish yet practical, an item you’ll likely never leave behind. The bag is rich in texture, soft and delicate, fashionable and beautiful. The front of the bag has a decorative pattern adornment. It is fashionable, beautiful, avant-garde, and shows fashion sense. The bag has a smooth zipper, which is equipped with a lengthened, convenient and practical leather pull head. The large capacity can comfortably hold an iPad Air, A4 size magazine, mobile phone, wallet, cosmetic, umbrella and other small things. Due to the deference in the measurement methods, Please allow up to 1/2 “1-2 cm in the size deviation. Backpack sewn, but the top material is not genuine leather. The Color is silver, and bronze, but also very beautiful. Convenient size-or a large or small. Satisfied with the purchase. Thanks to the store. I AM happy with a backpack full. Thanks to the store. AND shipping 2 weeks. Soft, pleasant to the touch, small and very comfortable. AND a special thanks for gift. Recommend! 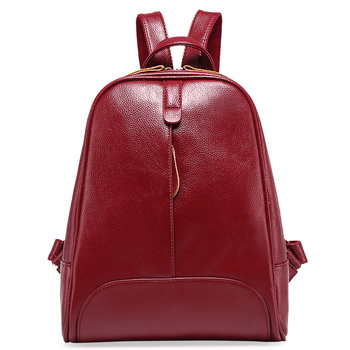 backpack high quality very beautiful! delivered very fast, accessories good, made carefully! packed in optional тканную bag. прослужит see how long, until all like! Received a wonderful backpack, adhere to back, It has a flip wallet and looks very high! There are many small compartments inside. Slim fit have on your back, I keep my mobile there. Not too small, very comfortable to carry. Strap are comfortable, super color. Standing recommendation to purchase. Satisfied with order. To seller thank you very much. I'll order more. Have a little smell but it will go away. I'll order again from this seller. Backpack good, very neat. Small. Recommend. backpack as picture. very cool. very high quality made, accessories good. recommend! Is very soft, But truth, me the imaginaba More large. пришёл goods. quality is good, all seams are very straight! item matches the description. thank you!